For anyone who's ever been an aspiring musician, 2 Pianos 4 Hands* will ring true. My instrument was clarinet, not piano, and I was nowhere near as good as the two characters in the show, who are very good by most people's standards, but not quite good enough to make it in the music world. Still, I can relate to "Every Good Boy Deserves Fudge" and practicing until you're bored silly. Such is the life of Teddy and Richie, aka Ted Dykstra and Richard Greenblatt, two Canadian actor/musicians who created the play based on their own experiences and have performed it all over the world. In Park Square Theatre's version, returning after a successful 2010 run, the 4 hands belong to Michael Pearce Donley and Peter Vitale (who is also responsible for the delightful sound and music that accompanies Ten Thousand Things' unique productions). Both Michael and Peter possess a pretty amazing (and I would think rare) combination of skills - they're excellent pianists as well as great actors, delivering funny and heartfelt performances. No wonder this show sells out - funny, relateable, and featuring some beautiful classical music (as well as a few pop pieces thrown in for fun). The show opens on a stage that is bare except for two grand pianos. Two pianists enter in tuxes with tails, seemingly elegant and professional, until they start to wordlessly bicker about who gets which piano and which bench. The hilarity continues from there as we flash back to childhood lessons, with the actors taking turns playing the young child and their various teachers. We follow them through the early days of lessons, fights with their parents about practicing too much or not enough, junior high competitions, and trying to get into that school where they think they belong, until they're told they're not quite good enough, whereupon they're forced to give lessons to housewives or perform in piano bars for drunks. But through it all, there's the music. The dueling duets are the most fun, as they make it into a competition, whether they're sitting at the same piano or each at their own. A medley of pop tunes turns into a fun game of "name that tune," from the The Young and The Restless theme song to Charlie Brown's theme song. And finally, the show ends with a long and impressive piece (Bach's Concerto in D minor, 1st Movement, for you classical music fans), that to my untrained ears, sounds like it's being performed by a couple of classical musicians. 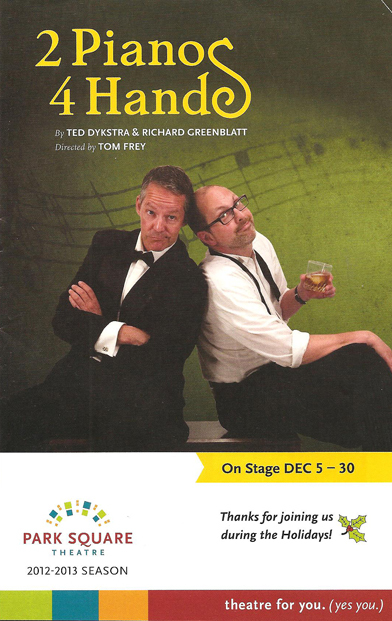 2 Pianos 4 Hands is playing at Park Square Theatre now through December 30. It's definitely worth checking out for some rare non-holiday related fun and beautiful piano music. *I received two complementary tickets to the show.